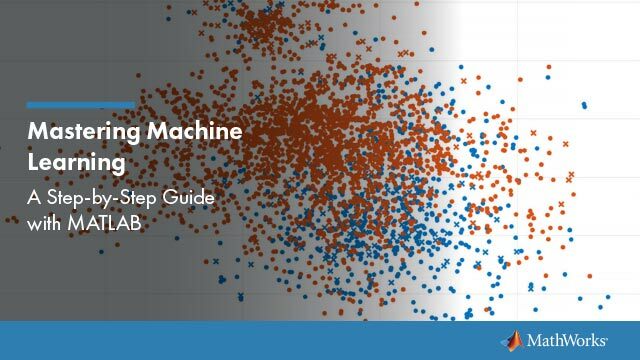 This example shows how to use logistic regression and other techniques to perform data analysis on tall arrays. Tall arrays represent data that is too large to fit into computer memory. When you execute calculations on tall arrays, the default execution environment uses either the local MATLAB® session or a local parallel pool (if you have Parallel Computing Toolbox™). You can use the mapreducer function to change the execution environment. Set the global execution environment to be the local MATLAB session. Create a datastore that references the folder location with the data. The data can be contained in a single file, a collection of files, or an entire folder. Treat 'NA' values as missing data so that datastore replaces them with NaN values. Select a subset of the variables to work with, and include the name of the airline (UniqueCarrier) as a categorical variable. Create a tall table on top of the datastore.
? ?             ? ?           ? Determine the flights that are late by 20 minutes or more by defining a logical variable that is true for a late flight. Add this variable to the tall table of data, noting that it is not yet evaluated. A preview of this variable includes the first few rows. ?              ? ?           ? ?            ? Calculate the mean of LateFlight to determine the overall proportion of late flights. Use gather to trigger evaluation of the tall array and bring the result into memory. Examine whether certain types of flights tend to be late. First, check to see if certain carriers are more likely to have late flights. Carriers B6 and EV have higher proportions of late flights. Carriers AQ, ML(1), and HA have relatively few flights, but lower proportions of them are late. Next, check to see if different days of the week tend to have later flights. Wednesdays and Thursdays have the highest proportion of late flights, while Fridays have the lowest proportion. Check to see if longer or shorter flights tend to be late. First, look at the density of the flight distance for flights that are late, and compare that with flights that are on time. Flight distance does not make a dramatic difference in whether a flight is early or late. However, the density appears to be slightly higher for on-time flights at distances of about 400 miles. The density is also higher for late flights at distances of about 2000 miles. Calculate some simple descriptive statistics for the late and on-time flights. Late flights are about 60 miles longer on average, although this value makes up only a small portion of the standard deviation of the distance values. 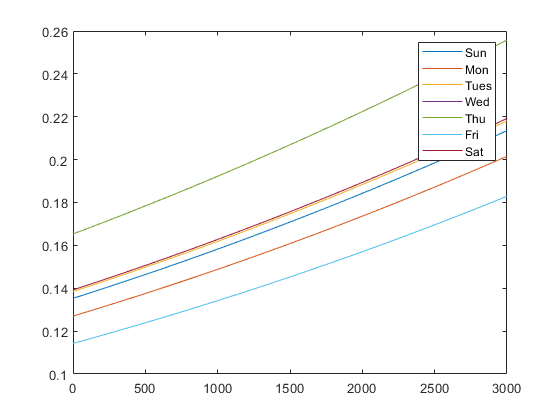 Build a model for the probability of a late flight, using both continuous variables (such as Distance) and categorical variables (such as DayOfWeek) to predict the probabilities. This model can help to determine if the previous results observed for each predictor individually also hold true when you consider them together. The Wednesday and Thursday coefficients are positive, indicating a higher probability of a late flight on those days. The Friday coefficient is negative, indicating a lower probability. The Distance coefficient is positive, indicating that longer flights have a higher probability of being late. All of these coefficients have very small p-values. This is common with data sets that have many observations, since one can reliably estimate small effects with large amounts of data. In fact, the uncertainty in the model is larger than the uncertainty in the estimates for the parameters in the model. Predict the probability of a late flight for each day of the week, and for distances ranging from 0 to 3000 miles. Create a table to hold the predictor values by indexing the first 100 rows in the original table tt. 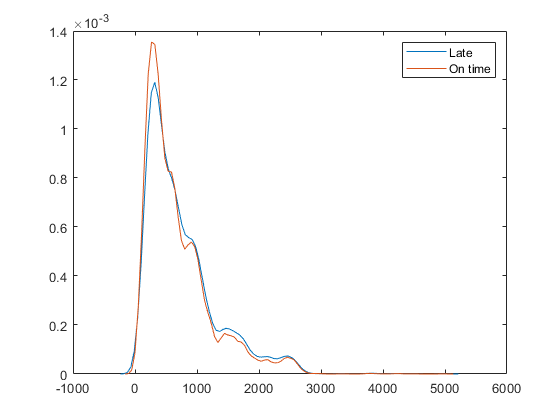 According to this model, a Wednesday or Thursday flight of 500 miles has the same probability of being late, about 18%, as a Friday flight of about 3000 miles. Since these probabilities are all much less than 50%, the model is unlikely to predict that any given flight will be late using this information. Investigate the model more by focusing on the flights for which the model predicts a probability of 20% or more of being late, and compare that to the actual results. Among the flights predicted to have a 20% or higher probability of being late, about 20% were late 1125/(1125 + 4391). Among the remainder, less than 16% were late 18394/(18394 + 99613).